\nDoing a 4-day / 3 night wheel\'n trip each summer has gotten to be a bit of a tradition for me the last several years. Normally, there are a ton of great local wheel\'n places that are only an hour or two from Seattle, as is the case with Manastash. But where many of the other places are great day trips, the Manastash Ridge area has 115 sq miles of territory to explore making it great for extended excursions and camping. This year, the adventure was pushed back to early October due to a busy Summer for all involved. \nWe set out late-ish Wednesday, sometime after lunch, under some wonderful sunny and warm early Autumn Seattle weather. 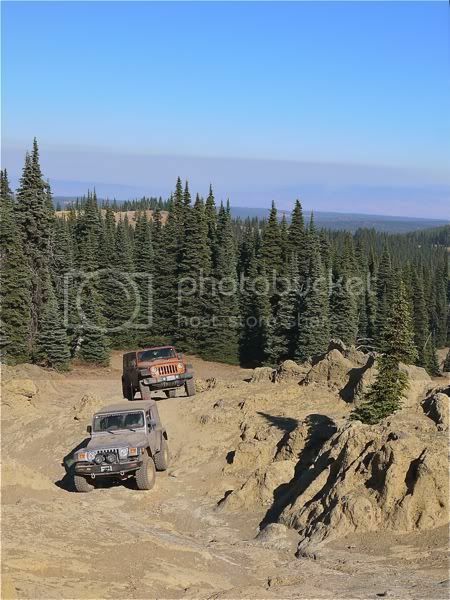 Our rigs (my yellow TJ, Joe\'s metallic orange 4-door JK (which we call "Glitter)", and Steve\'s silver V8 TJ) climbed over Snoqualmie Pass an hour later and topped off fuel in Ellensburg about an hour after that. About 20 miles out from Ellensburg we could see hazy smoke hanging in the afternoon sky and all the burned acreage from the massive wild fires that had been raging in the area all summer. Fortunately, we were camping down wind from the fire areas so the smoke wouldn\'t be an issue for us. \nAfter the Ellensburg refuel we motored up Manastash Road which shot across some crop fields, then tucked itself into Manastash Canyon. About 15 minutes before starting up the first trailhead we had the first of only three malfunctions during the whole trip. It required heading back to town and a "quick" repair on the side of the road to fix an overloaded fuse and burned section of wiring harness. After that the rig was good the rest of the trip but it burned up nearly 2 hours. From Manastash Rd we turned onto the Berber Springs Rd and climbed up to the top of Manastash Ridge. By the time we left Berber Springs Rd and started on the trail to our campsite we were rapidly loosing daylight. In fact, as we motored along the trail on the ridge high above Manastash Lake we were doing some night wheel\'n and set up camp in the dark. \nMan was it cold. I expected it to be chilly and we all brought cold weather stuff but I hadn\'t quite expected it to be "this" cold. Wednesday night and in the nights ahead temperatures would be as warm as a refrigerator, high 30\'s. And because of the forest fires there was a burn ban in effect. Fortunately we brought along a "portable, propane-fueld campfire." Without that the cold would have driven us home. \nWe got into a pattern over the succeeding days of waking up late-ish, getting a slow start in the morning with plenty of BSing to go with breakfast. Then rolling out in the Jeeps late. We\'d dink around on the rock formations near camp for a bit before finally setting off to run some trails. Invariably we would get back to camp a couple hours after dark when we would fire up the portable campfire, get some movie or show playing on the iPads, and cook up some grub and shoot the breeze some more until we\'d get too tired and sack out around 11pm. \nThe mornings and nights were frigidly cold and we were all layered up with 2 pairs of pants or sweats, double layers of socks, triple layers of shirts and hoodies or jackets. But during the day, from about noon until dusk, it was pleasantly warm under gorgeous crystal blue skies. \nThe first full day, Thursday, we set out to do a loop on top of Manastash road. 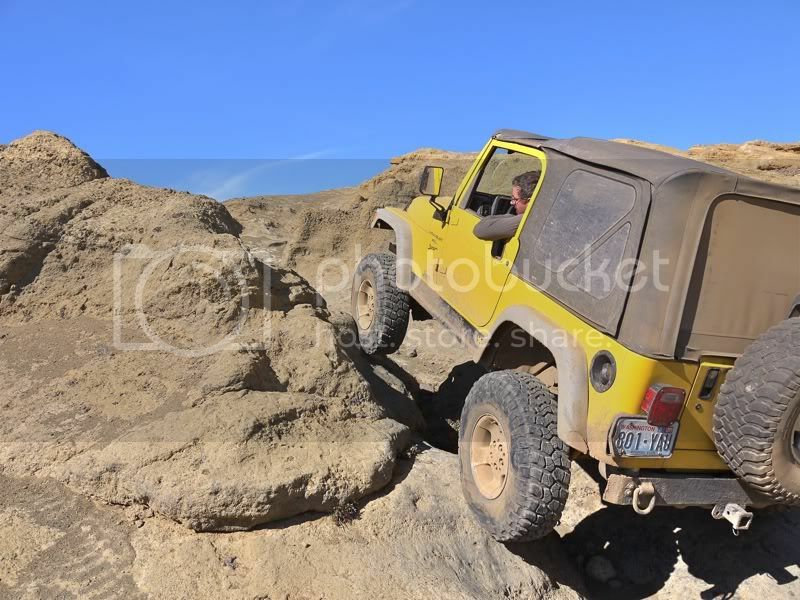 First, some dinking around rock crawling at Funnyrocks which was maybe 1 minute or a couple hundred yards from where we were camping. Then off for some trail running. We came down the Tripod Flats Trail til it intersected with Tipover Trail. As in past years, the trails were very bumpy and dusty but because of the cold we kept the tops up so the dust wasn\'t overwhelming. Shortly after turning off onto Tipover the trail came out of the woods and bumped over fields of barren, crumbled basalt, what we call rock gardens. Progress is slow here. It\'s not difficult but REALLY bumpy. It is at this point we came to a fallen tree. 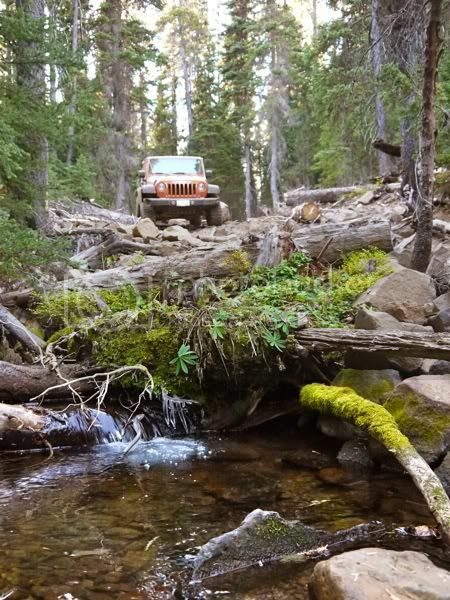 We could have left it and Jeeped around it on the rocks but we decided to cut up the tree and clear the trail route. After that we moved on and had fun on some hill climbs before the trail tucked back into the woods in some tight twisty sections that are very characteristic of NW trails. 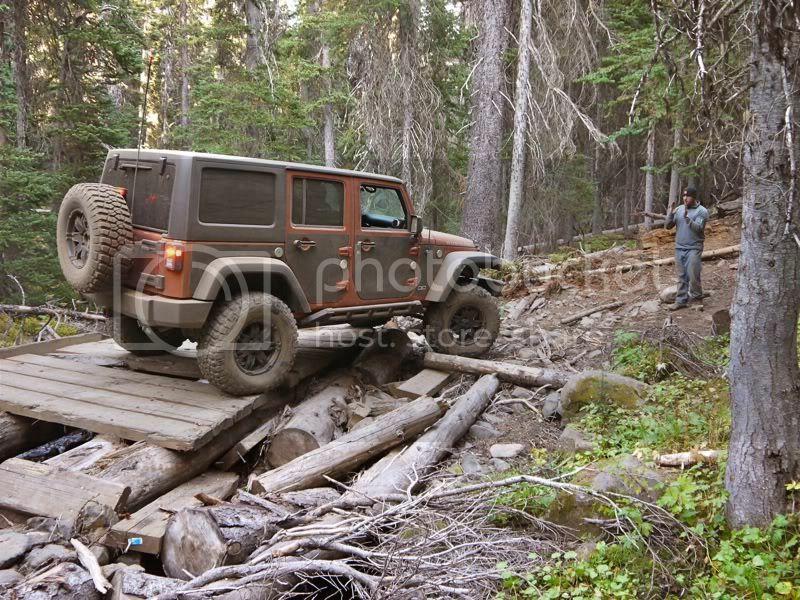 The JK did great but Joe had to watch it with his longer wheel base. Because of the late start and the tree clearing it was early afternoon when Tipover ended and we intersected with two other trails. We opted to save the trail to the top of Manastash Ridge for another day and looped back on Shoestring trail. At one point we reached a broken bridge and had fun crossing that. Then when Shoestring terminated at Tipover again we had more decision making to do. It was late afternoon and we\'d loose daylight before long but we headed down to check out Lost Lake. The trail drops down into a ravine and parallels Tripod Flats trail to the lake. It\'s tight at the bottom and VERy bumpy. It\'s also a one way in, one way out trail. But the lake was worth it. 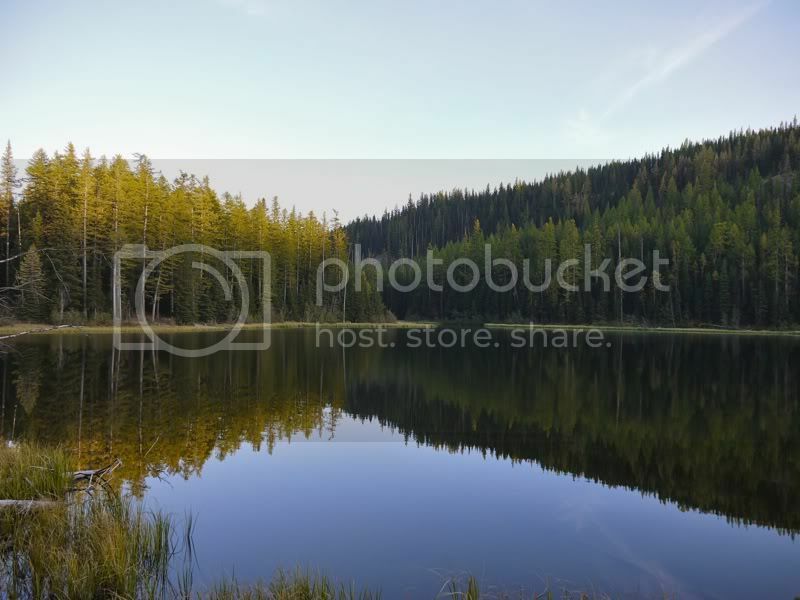 Lost Lake was serene with mirror smooth water and we spent some time enjoying the beauty of that and walking on foot around the lake to a campsite on the water\'s edge. When the sun dipped below the tree line we got back in our rigs and headed out. Back up on top on the Tripod Flats trail we drove the short distance to the actual Tripod Flats, a gently slopped meadow. Our main goal was to use the outhouse at the hunting shelter there. But as we arrived there was a heard of 20 elk on the far side of the meadow. They looked at us and unhurriedly scampered away, seemingly unaware hunting season started in 2 days. When we finished at the hunting shelter it was dark and we were about an hour out from camp. 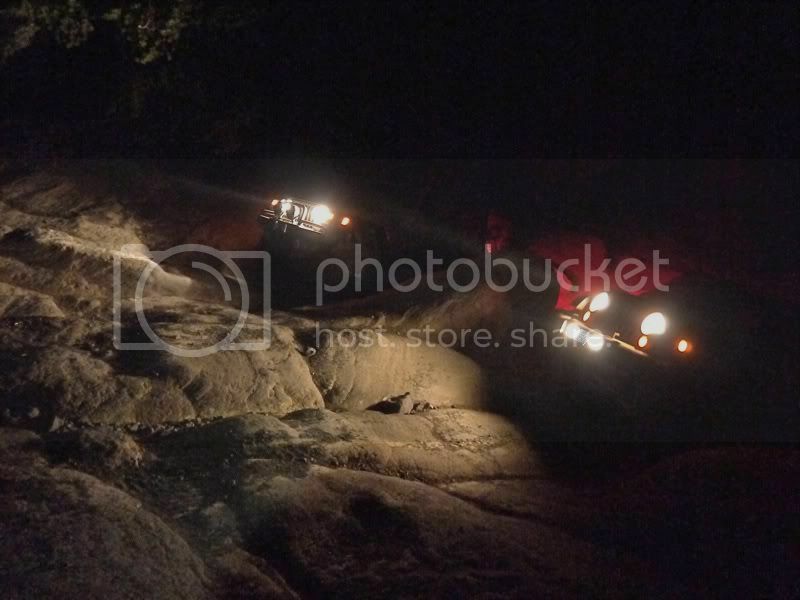 And thus we got some night wheel\'n in, including doing a little night rock crawling back at Funnyrocks. \nFriday we decided to drop down to Hwy 410 and fuel up at Whistling Jacks. 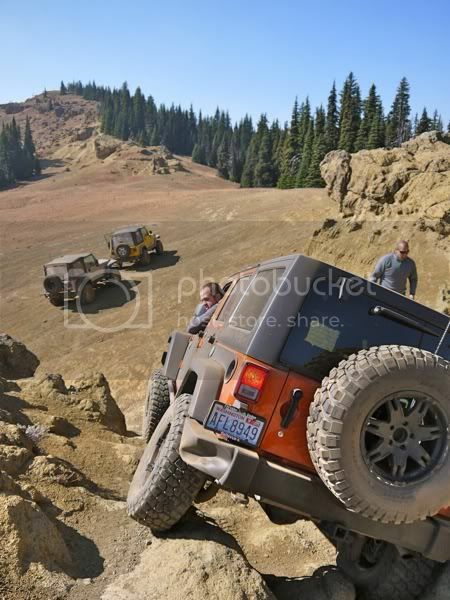 Of course, we played around a little at Funnyrocks before dropping down the Four Fingers hillclimb. Then up Lillypond Lake and down the Kaner Flats trail, heading down the two steep hill climbs. 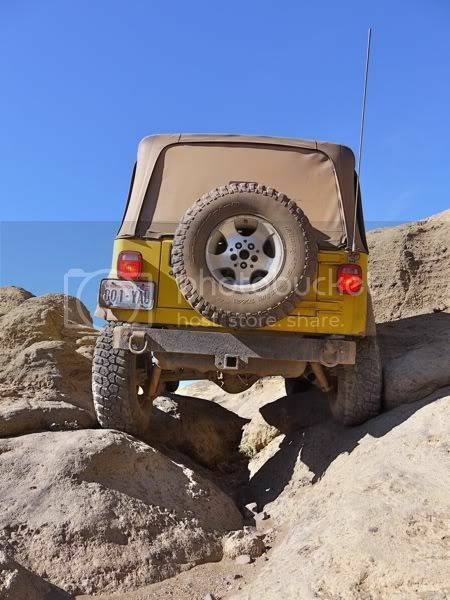 When we reached pavement Joe noticed he had bent his tie rod. This really confused the JK\'s traction / stability control computers and they kept trying to individually brake a couple of the wheels and cut power to the engine. So we pulled over to fix it. 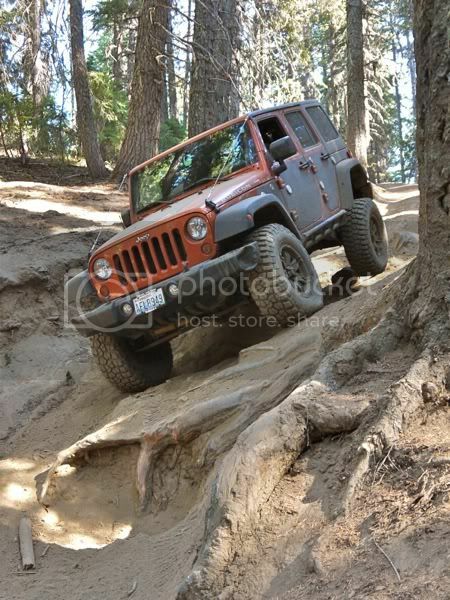 We did so by running out my winch line and set the hook on the tie rod, then Joe hit the throttle in reverse and let his rig snap hard against the winch line. 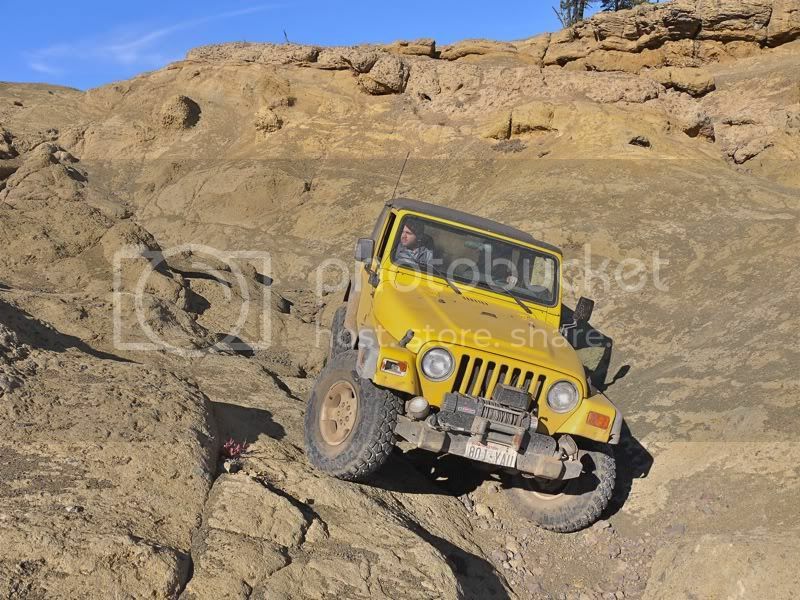 A few time doing this and the tie rod was straight again. A little more wrench work to re-straighten the steering wheel and he was good to go. No more problems from the computers. \nAfter fueling up we headed back up Kaner Flats. At this time it\'s the only (reasonable) way up to Manastash Ridge as the other access routes have been washed out from flooding a couple Springs ago and the roads aren\'t slated to be repaired for another year. Back at Lilly Pond Lake we headed across more rock fields and worked our way up to the top of Manastash Ridge. 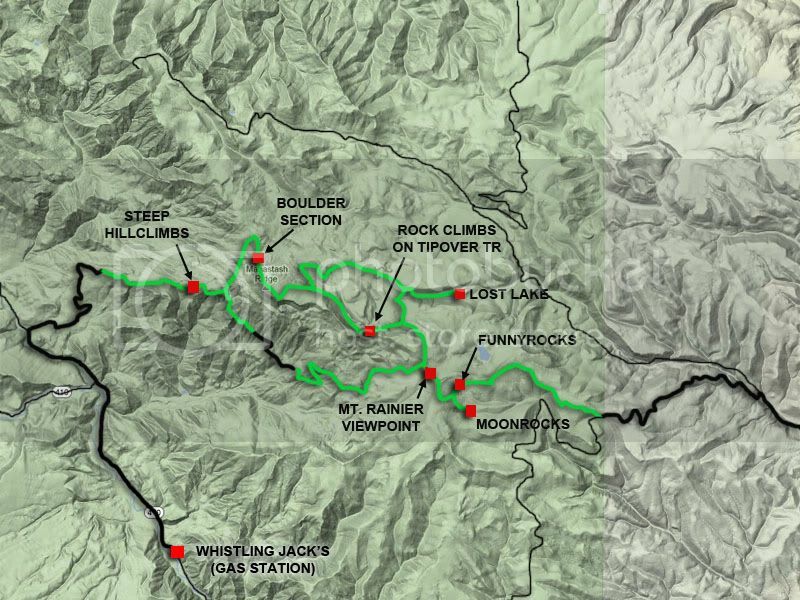 Joe wanted to conquer a boulder-strewn section of trail that gave us difficulty last year. 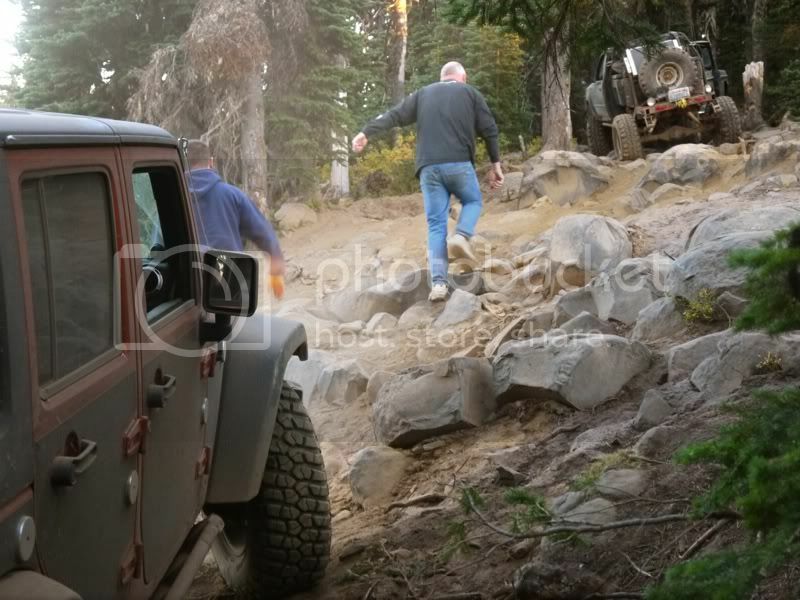 As we were scouting the route through the boulders another group came up and Jeeped on through. No problem . . . except one of their rigs "broke down" mid-way through with engine / carb troubles and it took awhile to get him going again. It was later afternoon / early evening again when we finally took our crack at it. The guys from the other group stayed with us to watch and they pitched in when we had to work a bit to get the big JK through, including the guys helping to move a large bolder that was in the way. I followed the JK with out much issue but then we had to winched Steve and his TJ through a particularly tricky corner. It was just getting dark when we finished. And we were two hours out from camp. Under the light of our headlights and high beams we ran a section of Manastash Ridge Trail watching the sun set over Mt. Rainier on the horizon. Then we dropped down in utter darkness to run the Tipover trail backwards. Midway through this we came to a clearing and shut off the engines and lights. The stars were out bright, millions of them, in the inky blackness. With no light pollution up on the ridge we were treated to a grew view of the heavens. Then on we pressed, snaking our way through the tight twists and turns of Tipover again. Joe rubbed his hard top (again) several time before we reached camp. Then it was dinner and iPad entertainment until bed. \nSaturday was out last day. We got another slow start and then packed up most of camp. Then headed over to Moonrocks. Moonrocks is another rock outcropping like Funnyrocks . . . but bigger. 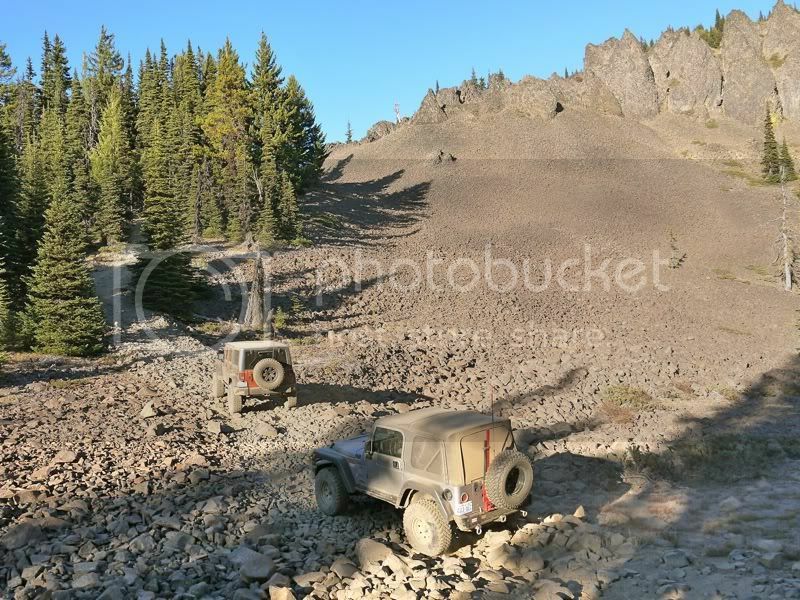 Joe and Steve were hesitant to push their luck in the rocks but we worked my TJ through some gullies and over some climbs and outcroppings until 3 or 4pm when we headed back to pack up the rest of camp and drive out. We exited via Berber Springs again and stopped to do a little target shooting on the way out. When we hit pavement to air up I noticed a worn tie rod end at the pitman arm. It\'d get me home but it needed to be changed. I think it was simply a worn component rather than attributable to trail damage. \nWe had a good time despite the cold. See you next year, Manastash. . . .
\nManastash Ridge Trip Photo Album, click here. \nOne minute away from camp, we start coming down Funnyrock Thursday morning. 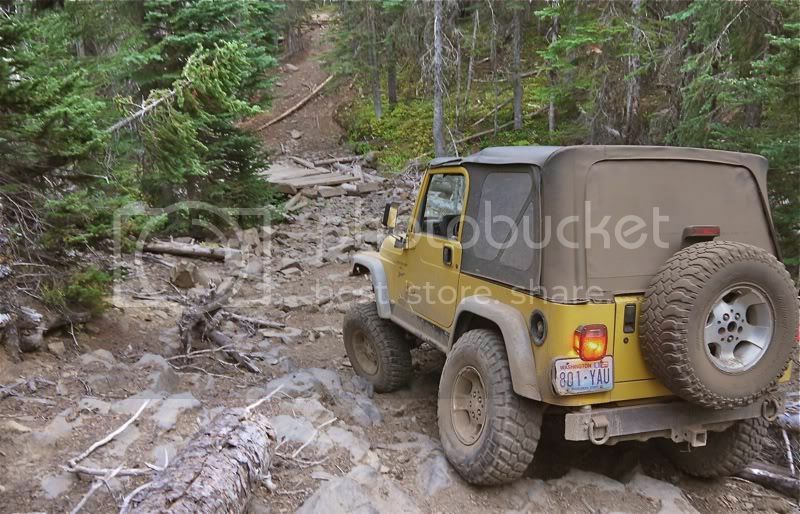 \nWorking Joe\'s Jeep, Glitter, through the rocks at Funnyrocks. \nPlaying around at Funnyrocks Thursday morning before the trail run. \nAt Funnyrocks on the "by pass" side route. 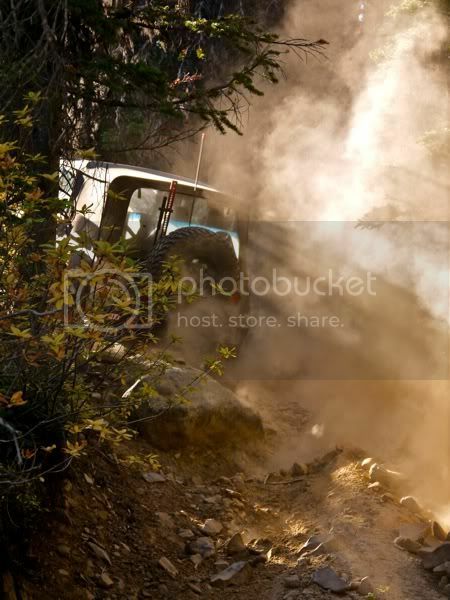 \nThe dust was thick on Tipover at some of the hill climbs. \nClimbing up some rocks on the Tipover trail, they got a little steep. \nof the rock fields in the background. \nThe trail drove over the rock fields / gardens such as these. \nHeading toward the broken bridge on the Shoestring trail. \nhelping us to avoid the stream. \nthe (cold) atmosphere for a little bit late in the day. 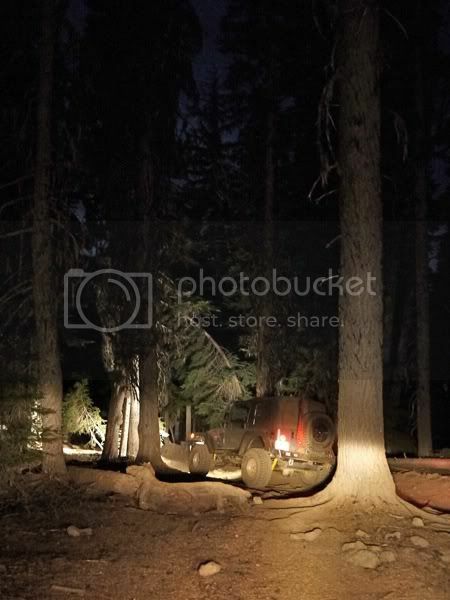 \nDoing some night wheel\'n as we head back to camp Thursday night. 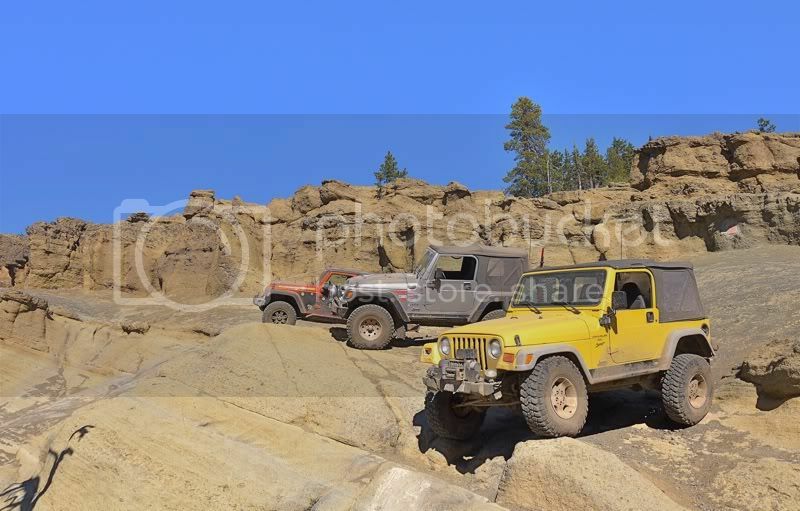 \nA little night rock crawl\'n, too, back at Funnyrocks near camp. \nClear blue skies and a beautiful Mt. Rainier off in the distance on Friday morning. \nFingers hill climb on our way down to Hwy 410 and fuel. \nDropping down Ardvark Hill on the Kaner Flats trail. \nWorking our way through the twisty trail sections. \nGetting late. . . . heading up the Kaner Flats trail again, crossing the rock gardens. \nthe other group helped out moving the rock. \nAt the end of the boulder section. \nGroup photo at Funnyrocks Saturday morning. \nFunnyrocks and our campsite . . . in the trees somewhere. \nthat can be treacherous but passable. \nthe gullies of Moonrocks, giving them rides. \npoint of reference and it\'s easy to get too far off camber and flip. \nSkid plates are my friend. \nThe skinny 33\'s worked great. Plenty of grip. \nA pinch point in a very narrow gully. \r\nWas this the trip for shooting to? This was the first time in14 years of offroading that I brought any firearms and it was mostly because one of my friends had a particular fear of cougars / bears . I kind of rolled my eyes at that but whatever. I kept the rifle next to my sleeping bag at night with a loaded magazine ready to go. I guess he slept better over in his own tent. \r\nThe other part was that both of my friends were interested in doing a little target shooting. 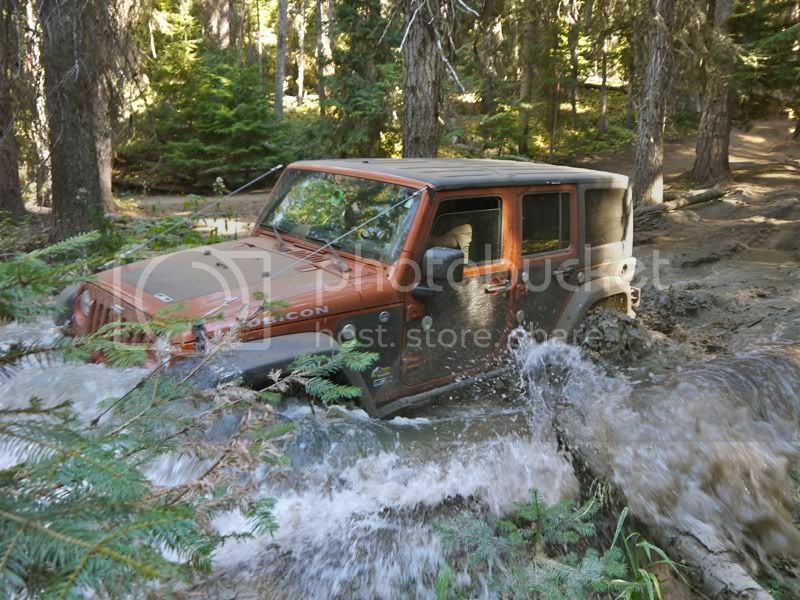 \r\nNormally, if I\'m heading out in the Jeep I want to spend my time Jeeping. But it was cool. We had a little competition going to see how many targets we each could it. Doing a 4-day / 3 night wheel'n trip each summer has gotten to be a bit of a tradition for me the last several years. Normally, there are a ton of great local wheel'n places that are only an hour or two from Seattle, as is the case with Manastash. But where many of the other places are great day trips, the Manastash Ridge area has 115 sq miles of territory to explore making it great for extended excursions and camping. This year, the adventure was pushed back to early October due to a busy Summer for all involved. We set out late-ish Wednesday, sometime after lunch, under some wonderful sunny and warm early Autumn Seattle weather. 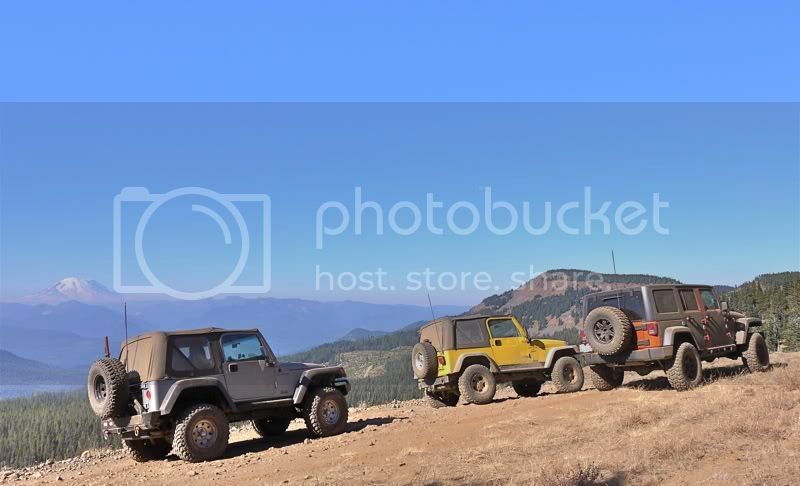 Our rigs (my yellow TJ, Joe's metallic orange 4-door JK (which we call "Glitter)", and Steve's silver V8 TJ) climbed over Snoqualmie Pass an hour later and topped off fuel in Ellensburg about an hour after that. About 20 miles out from Ellensburg we could see hazy smoke hanging in the afternoon sky and all the burned acreage from the massive wild fires that had been raging in the area all summer. Fortunately, we were camping down wind from the fire areas so the smoke wouldn't be an issue for us. After the Ellensburg refuel we motored up Manastash Road which shot across some crop fields, then tucked itself into Manastash Canyon. About 15 minutes before starting up the first trailhead we had the first of only three malfunctions during the whole trip. It required heading back to town and a "quick" repair on the side of the road to fix an overloaded fuse and burned section of wiring harness. After that the rig was good the rest of the trip but it burned up nearly 2 hours. From Manastash Rd we turned onto the Berber Springs Rd and climbed up to the top of Manastash Ridge. By the time we left Berber Springs Rd and started on the trail to our campsite we were rapidly loosing daylight. In fact, as we motored along the trail on the ridge high above Manastash Lake we were doing some night wheel'n and set up camp in the dark. Man was it cold. I expected it to be chilly and we all brought cold weather stuff but I hadn't quite expected it to be "this" cold. Wednesday night and in the nights ahead temperatures would be as warm as a refrigerator, high 30's. And because of the forest fires there was a burn ban in effect. Fortunately we brought along a "portable, propane-fueld campfire." Without that the cold would have driven us home. We got into a pattern over the succeeding days of waking up late-ish, getting a slow start in the morning with plenty of BSing to go with breakfast. Then rolling out in the Jeeps late. We'd dink around on the rock formations near camp for a bit before finally setting off to run some trails. Invariably we would get back to camp a couple hours after dark when we would fire up the portable campfire, get some movie or show playing on the iPads, and cook up some grub and shoot the breeze some more until we'd get too tired and sack out around 11pm. The mornings and nights were frigidly cold and we were all layered up with 2 pairs of pants or sweats, double layers of socks, triple layers of shirts and hoodies or jackets. But during the day, from about noon until dusk, it was pleasantly warm under gorgeous crystal blue skies. The first full day, Thursday, we set out to do a loop on top of Manastash road. 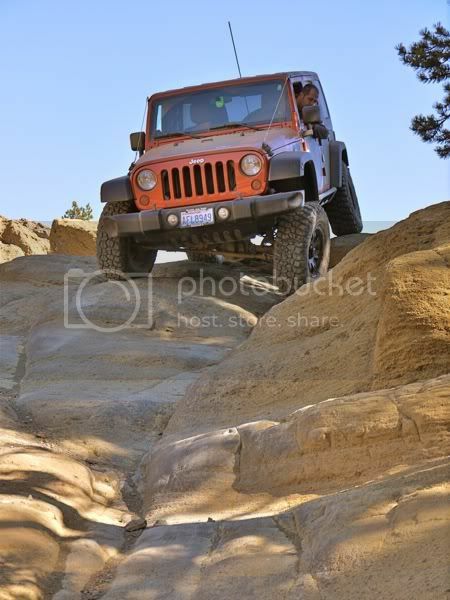 First, some dinking around rock crawling at Funnyrocks which was maybe 1 minute or a couple hundred yards from where we were camping. Then off for some trail running. We came down the Tripod Flats Trail til it intersected with Tipover Trail. As in past years, the trails were very bumpy and dusty but because of the cold we kept the tops up so the dust wasn't overwhelming. Shortly after turning off onto Tipover the trail came out of the woods and bumped over fields of barren, crumbled basalt, what we call rock gardens. Progress is slow here. It's not difficult but REALLY bumpy. It is at this point we came to a fallen tree. 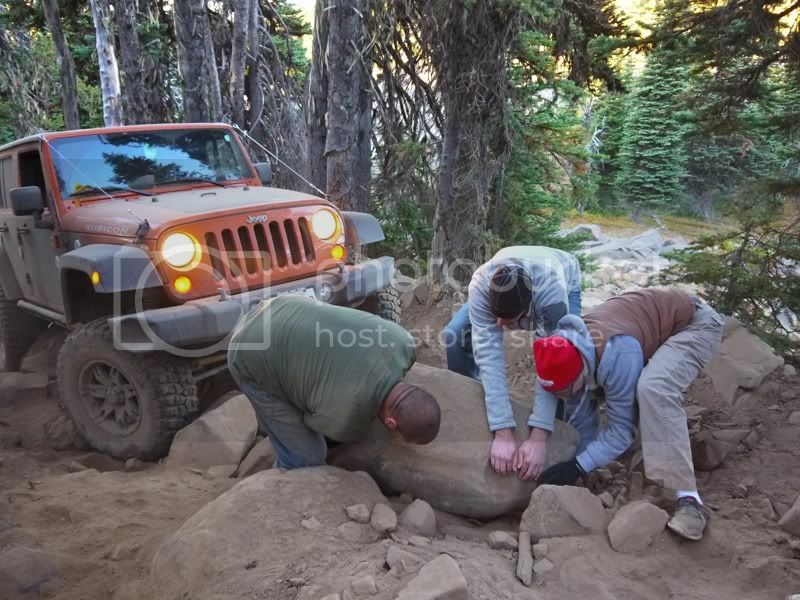 We could have left it and Jeeped around it on the rocks but we decided to cut up the tree and clear the trail route. After that we moved on and had fun on some hill climbs before the trail tucked back into the woods in some tight twisty sections that are very characteristic of NW trails. The JK did great but Joe had to watch it with his longer wheel base. Because of the late start and the tree clearing it was early afternoon when Tipover ended and we intersected with two other trails. We opted to save the trail to the top of Manastash Ridge for another day and looped back on Shoestring trail. At one point we reached a broken bridge and had fun crossing that. Then when Shoestring terminated at Tipover again we had more decision making to do. It was late afternoon and we'd loose daylight before long but we headed down to check out Lost Lake. The trail drops down into a ravine and parallels Tripod Flats trail to the lake. It's tight at the bottom and VERy bumpy. It's also a one way in, one way out trail. But the lake was worth it. Lost Lake was serene with mirror smooth water and we spent some time enjoying the beauty of that and walking on foot around the lake to a campsite on the water's edge. When the sun dipped below the tree line we got back in our rigs and headed out. Back up on top on the Tripod Flats trail we drove the short distance to the actual Tripod Flats, a gently slopped meadow. Our main goal was to use the outhouse at the hunting shelter there. But as we arrived there was a heard of 20 elk on the far side of the meadow. They looked at us and unhurriedly scampered away, seemingly unaware hunting season started in 2 days. When we finished at the hunting shelter it was dark and we were about an hour out from camp. And thus we got some night wheel'n in, including doing a little night rock crawling back at Funnyrocks. Friday we decided to drop down to Hwy 410 and fuel up at Whistling Jacks. 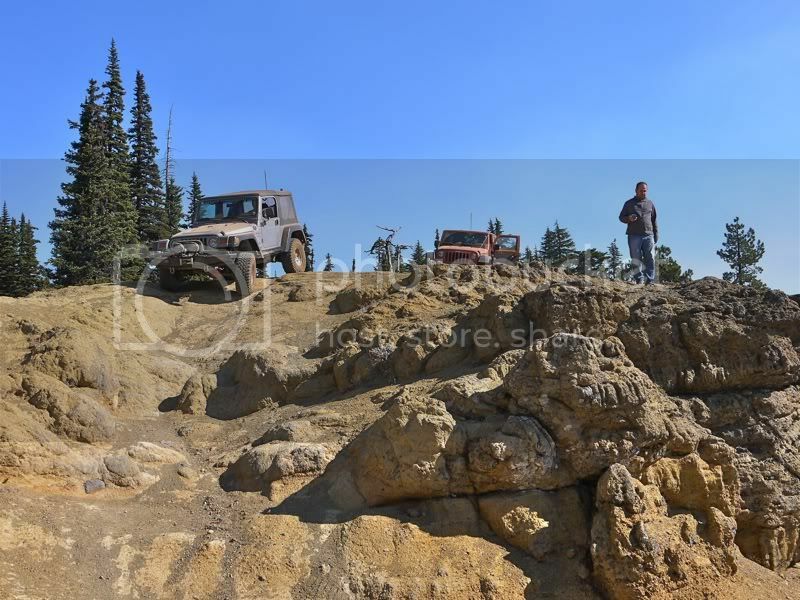 Of course, we played around a little at Funnyrocks before dropping down the Four Fingers hillclimb. Then up Lillypond Lake and down the Kaner Flats trail, heading down the two steep hill climbs. 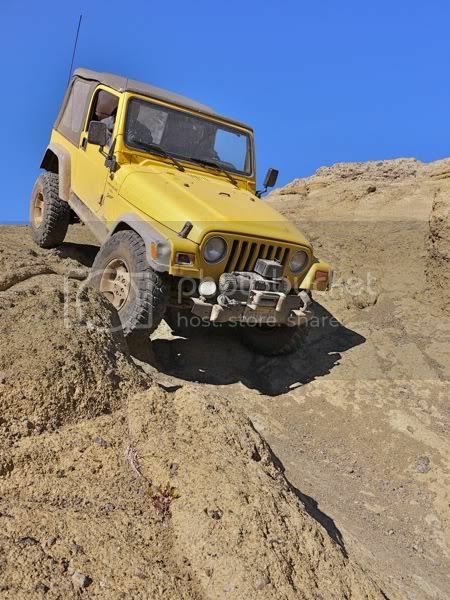 When we reached pavement Joe noticed he had bent his tie rod. This really confused the JK's traction / stability control computers and they kept trying to individually brake a couple of the wheels and cut power to the engine. So we pulled over to fix it. 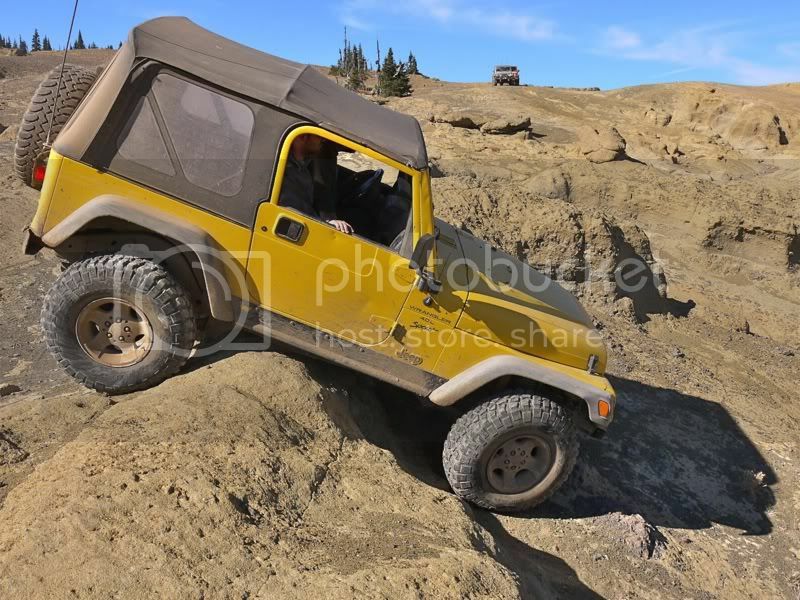 We did so by running out my winch line and set the hook on the tie rod, then Joe hit the throttle in reverse and let his rig snap hard against the winch line. 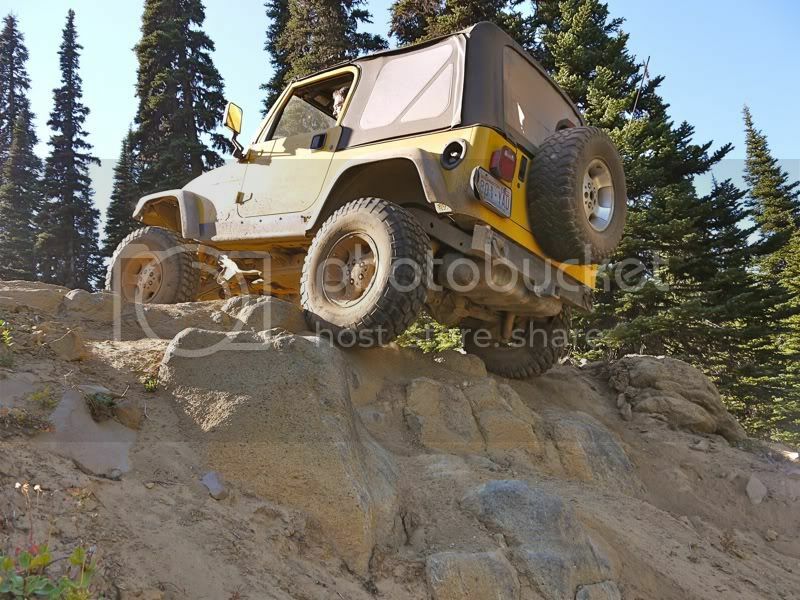 A few time doing this and the tie rod was straight again. A little more wrench work to re-straighten the steering wheel and he was good to go. No more problems from the computers. After fueling up we headed back up Kaner Flats. At this time it's the only (reasonable) way up to Manastash Ridge as the other access routes have been washed out from flooding a couple Springs ago and the roads aren't slated to be repaired for another year. Back at Lilly Pond Lake we headed across more rock fields and worked our way up to the top of Manastash Ridge. Joe wanted to conquer a boulder-strewn section of trail that gave us difficulty last year. 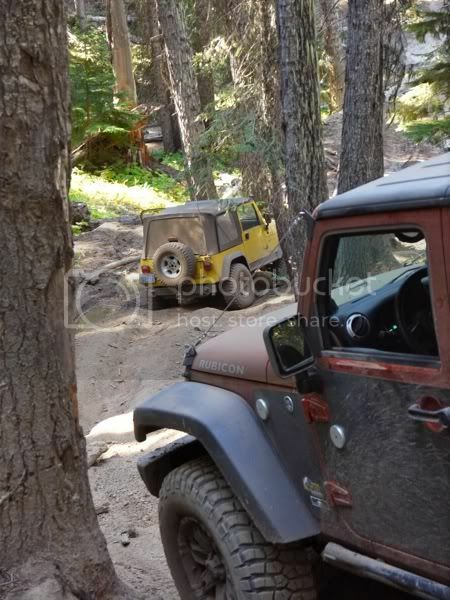 As we were scouting the route through the boulders another group came up and Jeeped on through. No problem . . . except one of their rigs "broke down" mid-way through with engine / carb troubles and it took awhile to get him going again. It was later afternoon / early evening again when we finally took our crack at it. The guys from the other group stayed with us to watch and they pitched in when we had to work a bit to get the big JK through, including the guys helping to move a large bolder that was in the way. I followed the JK with out much issue but then we had to winched Steve and his TJ through a particularly tricky corner. It was just getting dark when we finished. And we were two hours out from camp. Under the light of our headlights and high beams we ran a section of Manastash Ridge Trail watching the sun set over Mt. 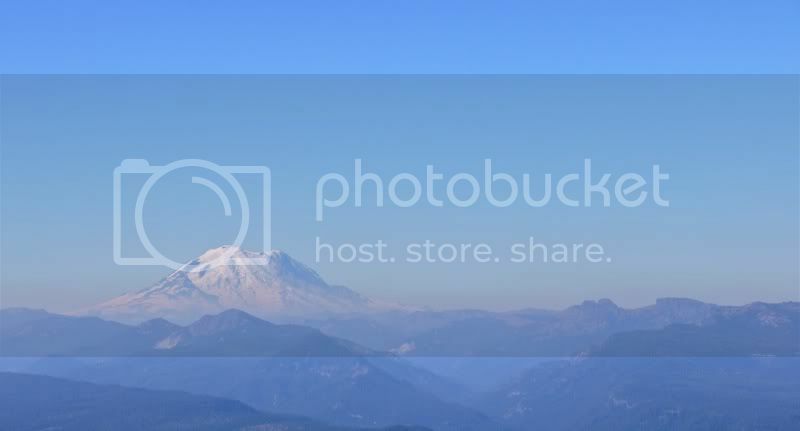 Rainier on the horizon. Then we dropped down in utter darkness to run the Tipover trail backwards. Midway through this we came to a clearing and shut off the engines and lights. The stars were out bright, millions of them, in the inky blackness. With no light pollution up on the ridge we were treated to a grew view of the heavens. Then on we pressed, snaking our way through the tight twists and turns of Tipover again. Joe rubbed his hard top (again) several time before we reached camp. Then it was dinner and iPad entertainment until bed. Saturday was out last day. We got another slow start and then packed up most of camp. Then headed over to Moonrocks. Moonrocks is another rock outcropping like Funnyrocks . . . but bigger. 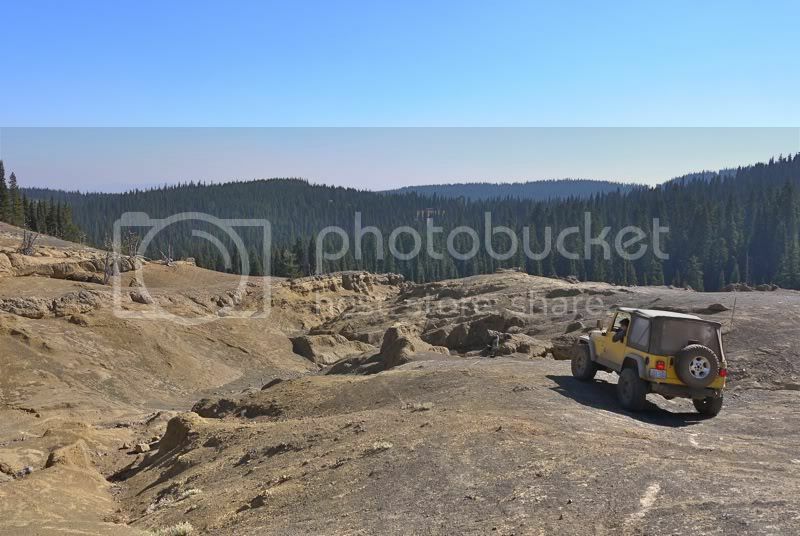 Joe and Steve were hesitant to push their luck in the rocks but we worked my TJ through some gullies and over some climbs and outcroppings until 3 or 4pm when we headed back to pack up the rest of camp and drive out. We exited via Berber Springs again and stopped to do a little target shooting on the way out. When we hit pavement to air up I noticed a worn tie rod end at the pitman arm. It'd get me home but it needed to be changed. I think it was simply a worn component rather than attributable to trail damage. We had a good time despite the cold. See you next year, Manastash. . . .
Manastash Ridge Trip Photo Album, click here. One minute away from camp, we start coming down Funnyrock Thursday morning. 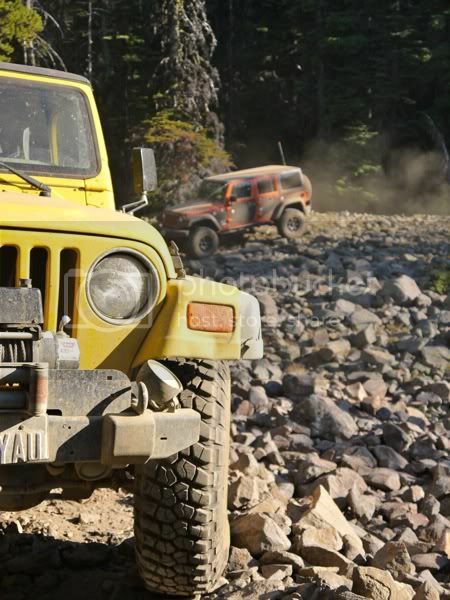 Working Joe's Jeep, Glitter, through the rocks at Funnyrocks. Playing around at Funnyrocks Thursday morning before the trail run. At Funnyrocks on the "by pass" side route. The dust was thick on Tipover at some of the hill climbs. Climbing up some rocks on the Tipover trail, they got a little steep. of the rock fields in the background. The trail drove over the rock fields / gardens such as these. Heading toward the broken bridge on the Shoestring trail. Last edited by lupinsea; 10-26-2012 at 04:04 PM.